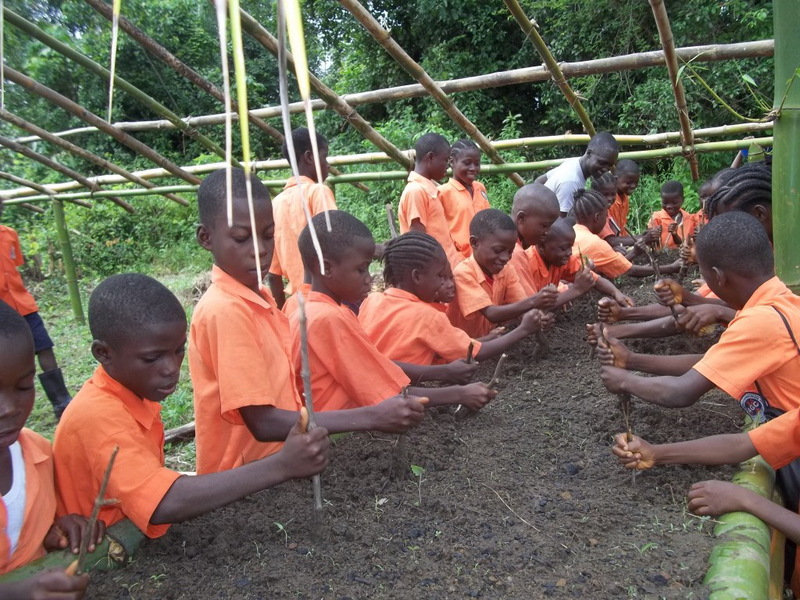 Organic Agriculture is becoming a major part of the daily activities at Civil Compound School. 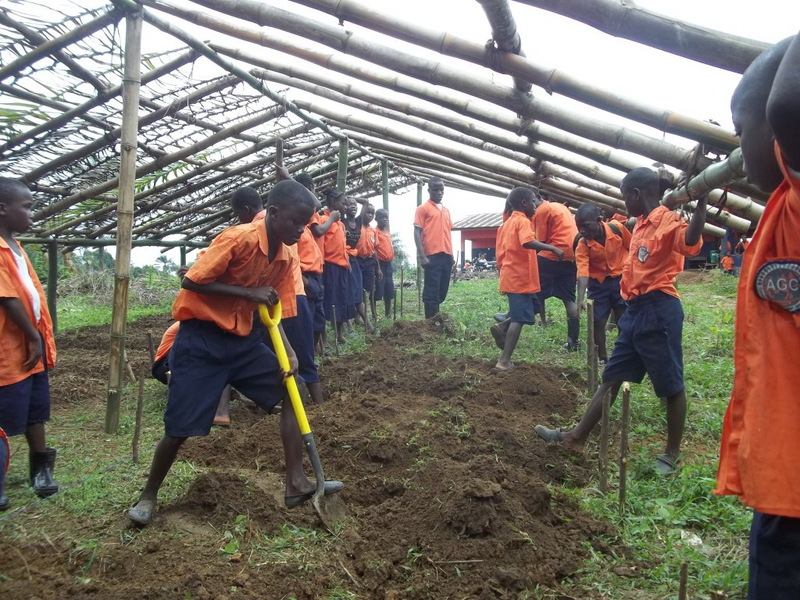 This school is situated in a farming community where many could benefit with the knowledge we are bringing to this school. It is great to see both teachers and students involved in making these gardens a success! This is a fantastic school program. It’s a pleasure working with the staff at this school and the students who delight in taking part. Jacob Lotodo, our intern from Kenya is showing students how to prepare the soil for planting seeds in the green house. 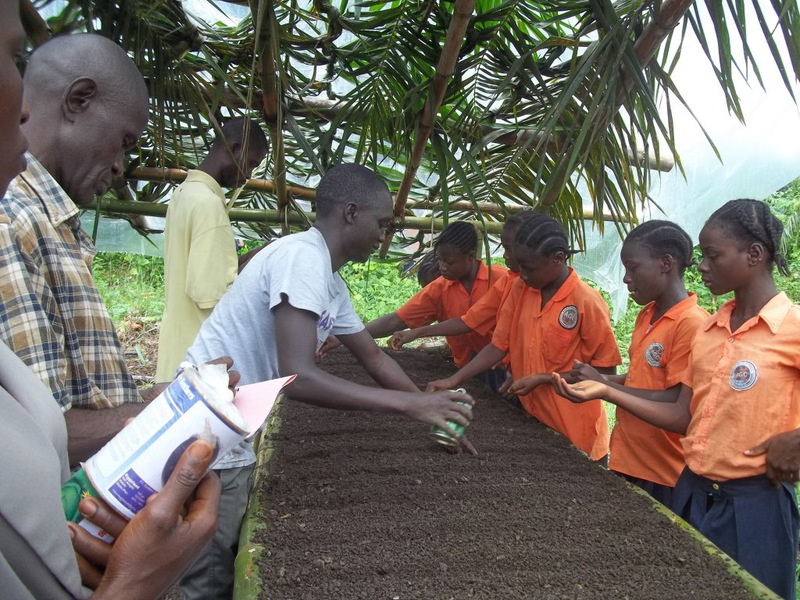 Students and teachers are involved in planting kale, cabbage and collard greens. 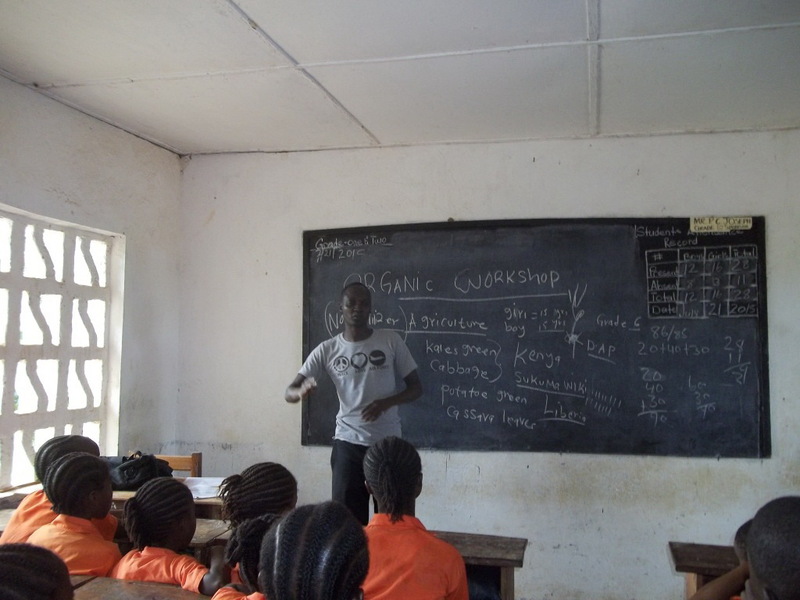 Jacob Lotodo teaches a class of students the importance of nutrition and how it relates to organic gardening. For example, Kale has a nutritional density of 1,000. White Rice has 11. 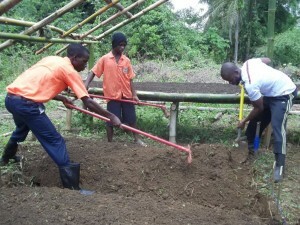 Joseph Sackie one of our trainers shows the students how to prepare the beds. 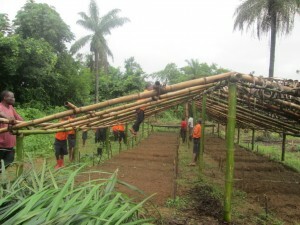 Students and Teachers help to put up the green house structure. 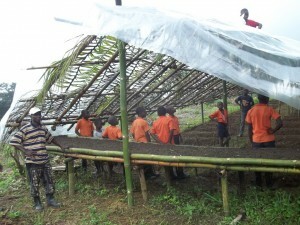 Students help to put palm leaves over the greenhouse to protect the young plants as they grow. 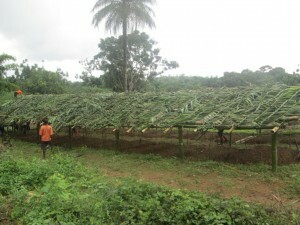 Plastic was put over the palm leaves to keep the torrential rains from wiping out the seedlings during rainy season. 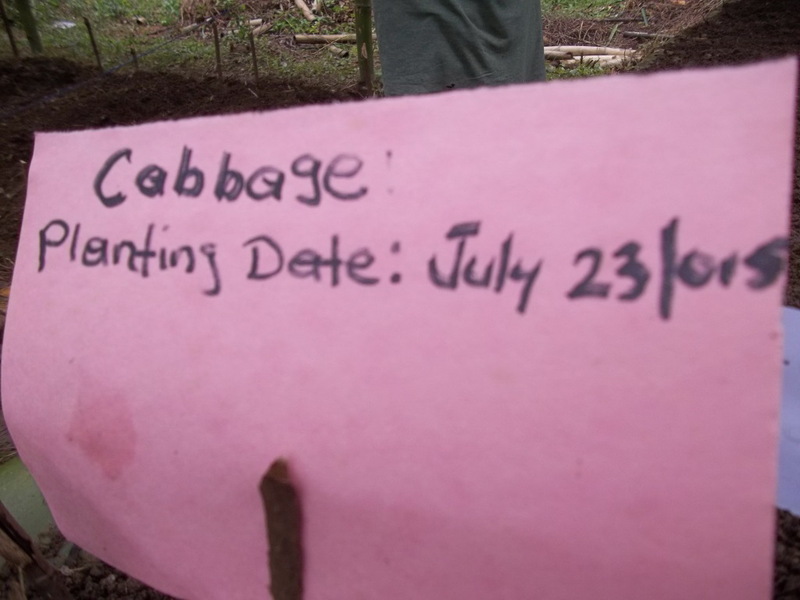 Each bed had a sign to say what was planted and the date. 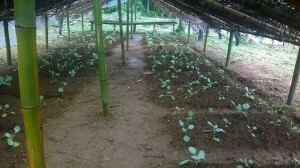 This is 2 months later with the young plants all needing to be transplanted. Kelvin Taweh working hard to prepare more beds for transplanting kale. Beds almost ready for transplanting. 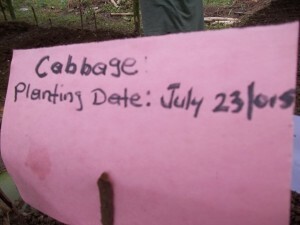 After this they add manure and compost. 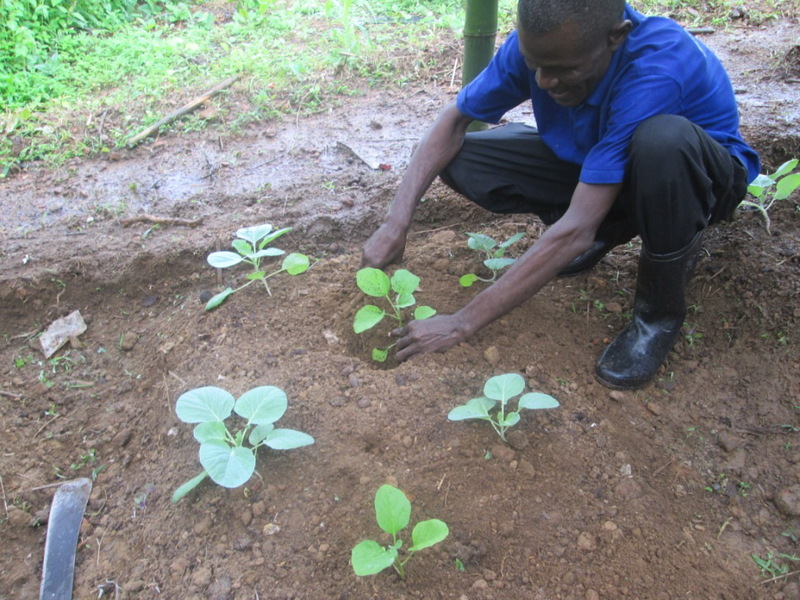 Isaac Sherman, the Registrar of the school is helping to transplant kale. He is very involved in overseeing the gardens. 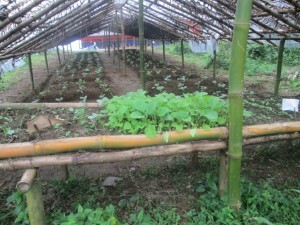 Plants are transplanted from the green house to open beds outside. 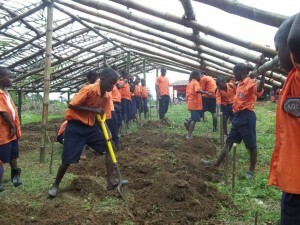 This school is funded by Serve the Children in the US with President Dr. Doug Collier and their board of directors. Local leadership in Liberia oversees this network of schools called “All God’s Children”. A couple of years ago, Provision of Hope was asked to partner with this school. We said yes! 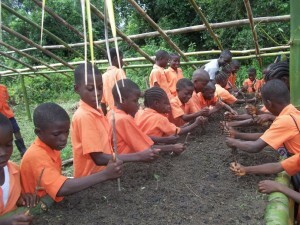 Thank you to all those who sponsor a student at Civil Compound, through Provision of Hope. If anyone would like to sponsor a student, please do get in touch with us. 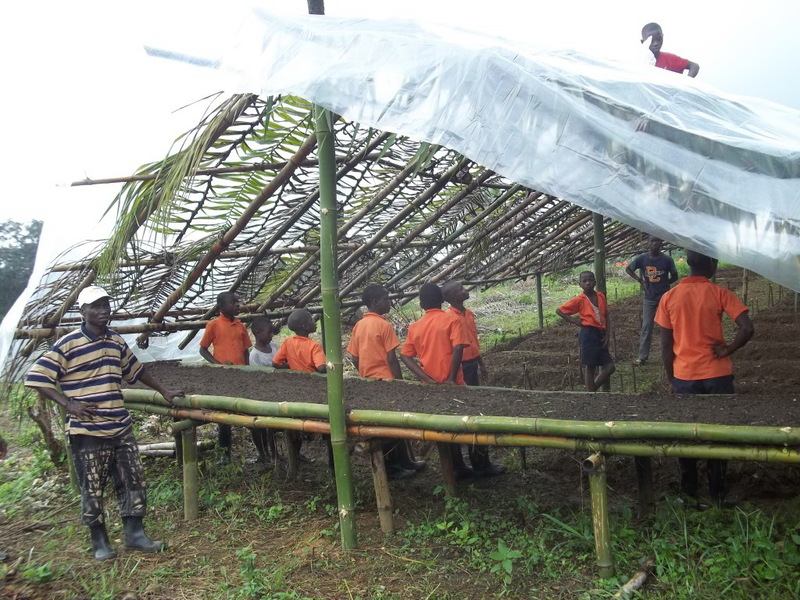 These students do not have their own funding to go to school. They are from very poor homes. Serve the Children offers free tuition to these students. 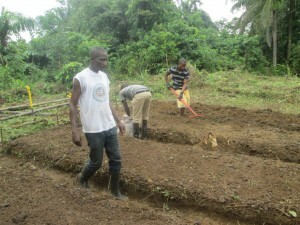 We will continue our training in Organic Nutritional Agriculture all over Liberia. Hopefully by January 2016, Dale Bolton, Founder of Organics4Orphans, will have a school curriculum ready for teaching this in our schools. 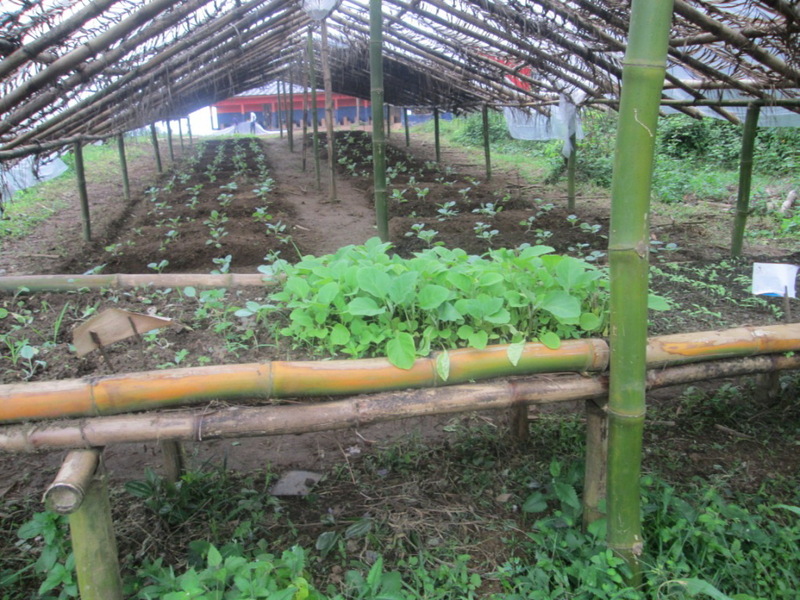 This country is in the rain forest with rich soil that produces excellent crops when properly cared for. This is one of our most worthy endeavors since our first going to Liberia in 2003. It takes time and it takes local Liberians who grasp the value of nutrition in their diets, to make this program succeed. We are starting to see that happening! 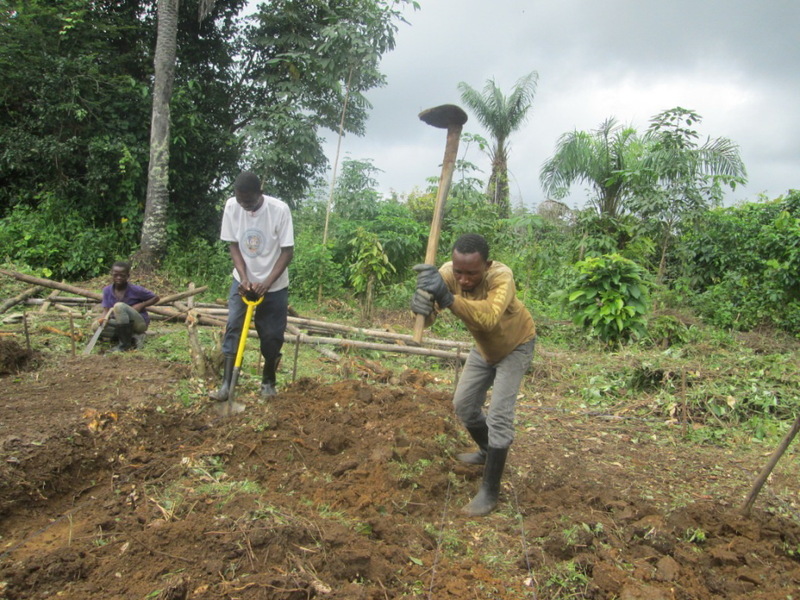 We want to thank Jacob Lotodo who came from Kenya’s Organics 4 Orphan’s program to help us get started in Liberia. We also want to thank our very own Kelvin Taweh and Joseph Sackie who went over to Kenya to take the Organic Agricultural Training. Thanks to Dale Bolton, Founder of O4O and Carl Thompson who introduced us to this field, then for coming to Liberia in February 2014 to hold training sessions with us. 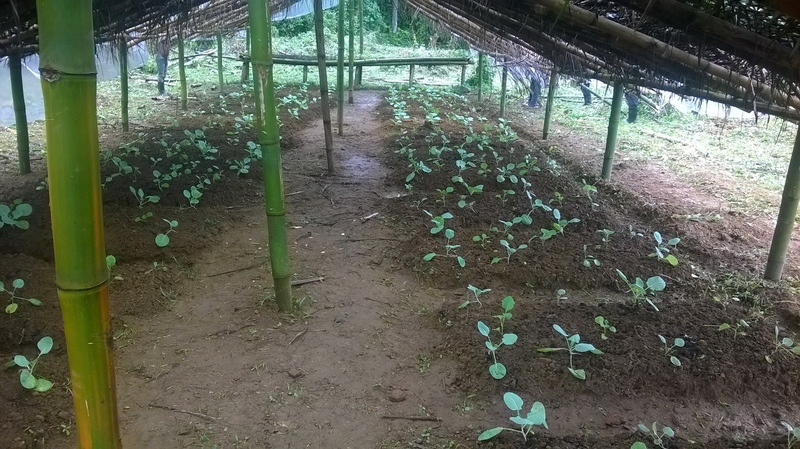 We have Organic Gardens at our Hope Homes and they are growing many varieties of vegetables and other nutritional food which is a real benefit to the children. 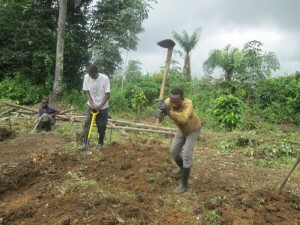 If anyone would like to donate towards our organic garden projects we would welcome your help. Our team is hoping to go back to the Civil Compound School this next week with more seeds, more hoes, watering cans, garden tools, manure etc. The costs for the next phase of this project is $ 585.00. 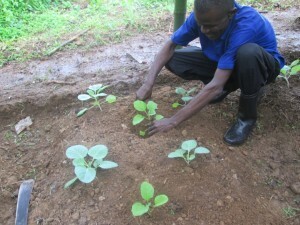 The Provision Garden Team will bring okra, pepper, tomato, cucumber, cabbage, and lettuce seeds with them.